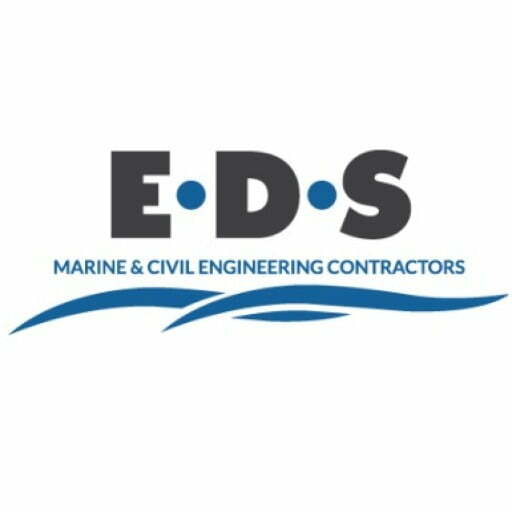 Through our confined space and diving expertise, EDS have developed a specialism for Bridge and Culvert engineering. We complete significant contracts for various Local Authorities and leading consultants, providing a range of services that support vital highways infrastructure. 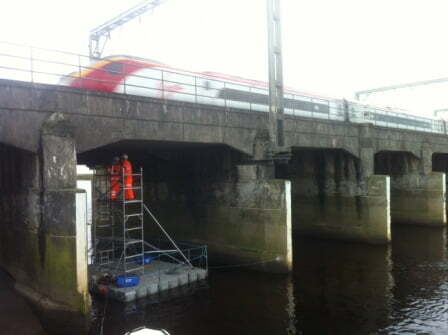 EDS can provide a range of services which support bridge engineering and maintenance. We have developed methodologies utilising innovative materials and bespoke practices that enable us to deliver best value sustainable solutions for our clients. 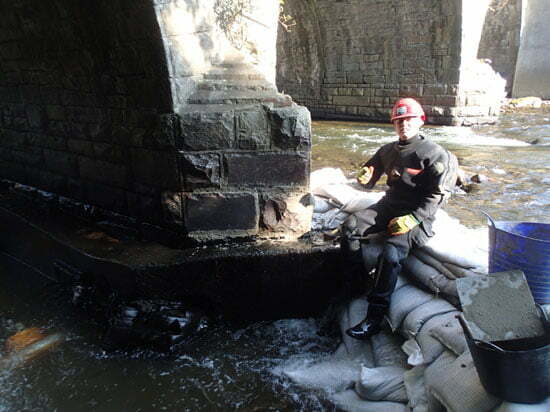 We have conducted abutment key stone replacement and underscour concrete repairs utilising temporary cofferdam works resulting in limited diversion of river flow and significantly reduced project time. 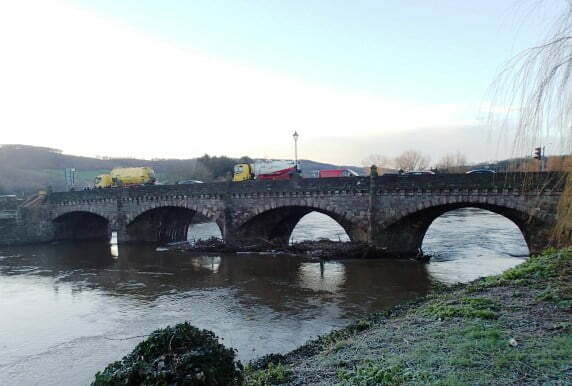 EDS can also remove debris, blockages and structures that increase strain on bridge structures reducing strength, our discrete methods allowed us to clear significant storm debris from a major A road viaduct without using the bridge itself, hence no disruption to traffic. 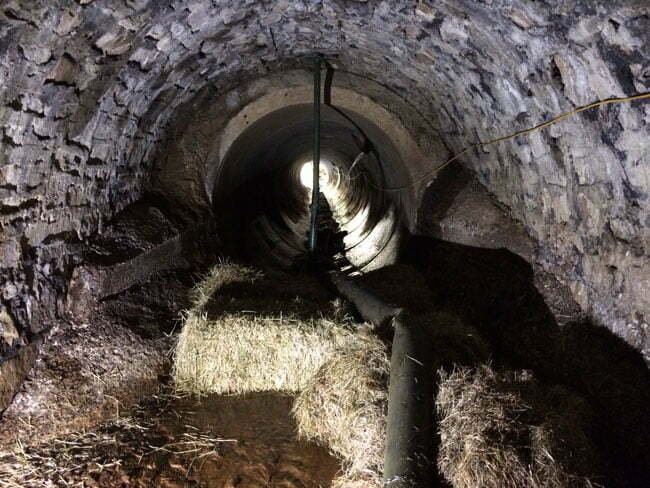 Culvert Inspections conducted by a professional confined space entry team, produce a video of internal culvert conditions, allowing the client to view the inspection footage, supported by the detailed report which plays a vital role in evaluating structural maintenance requirements, inspection frequency and department budgets. 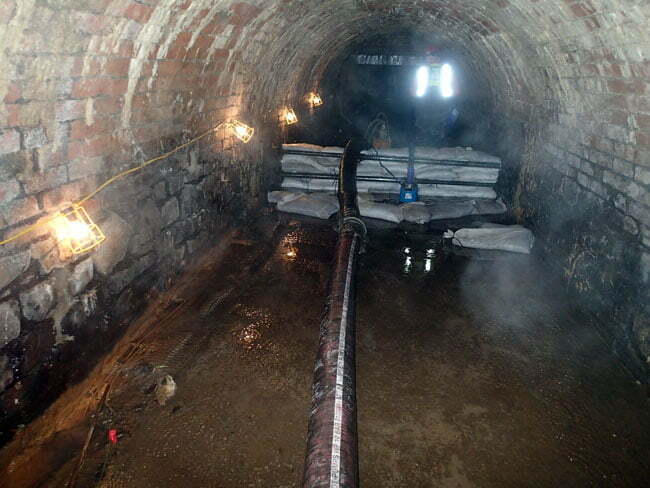 Our Confined Space entry team have conducted culvert inspections over 2km in length, providing narrated video inspections and detailed written reports on the condition and integrity of subterranean structures. 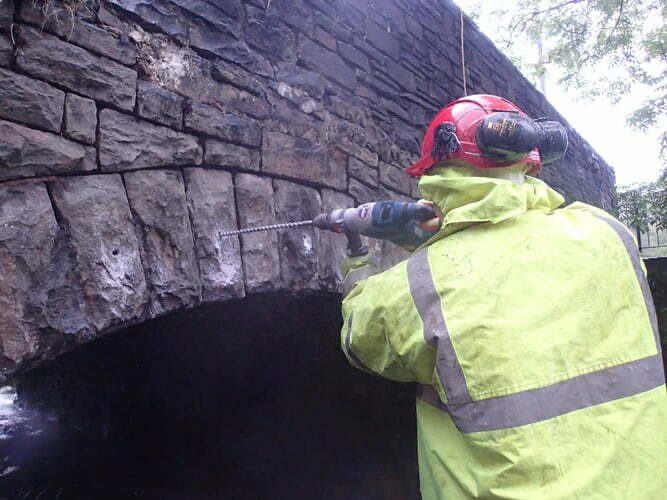 We undertake major culvert engineering repair work for scour voids and invert damage, offering a range of innovative solutions to provide the best value sustainable solution for the client. 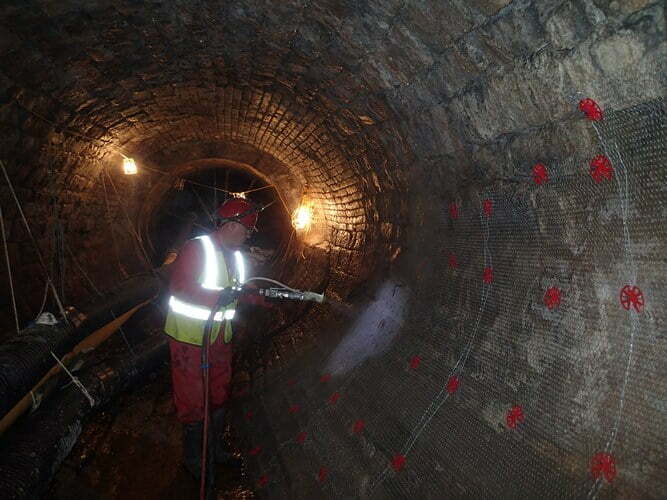 EDS have successfully completed a number of projects using a combination of methodologies for temporary works arrangements, concrete pumping a culvert invert 130m from access, render spraying culvert walls and ceilings, using a mix of natural cement and underwater concrete additives for quick setting and reduced pollution risk, both of which decrease duration of work and hence clients costs. 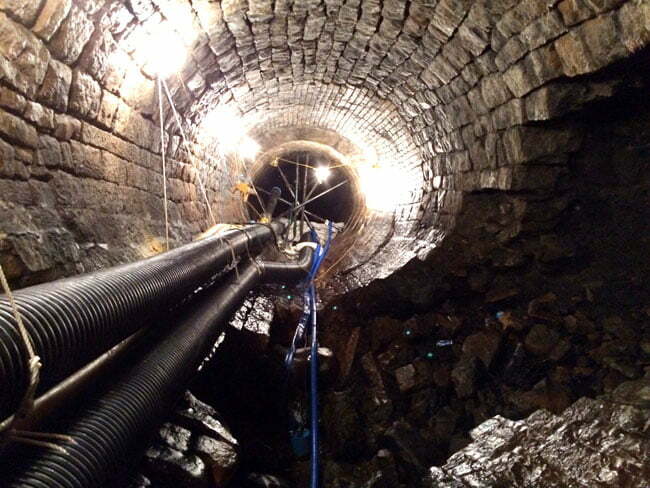 Read more about how we can tailor bespoke solutions to culvert challenges within our Project Case Studies. 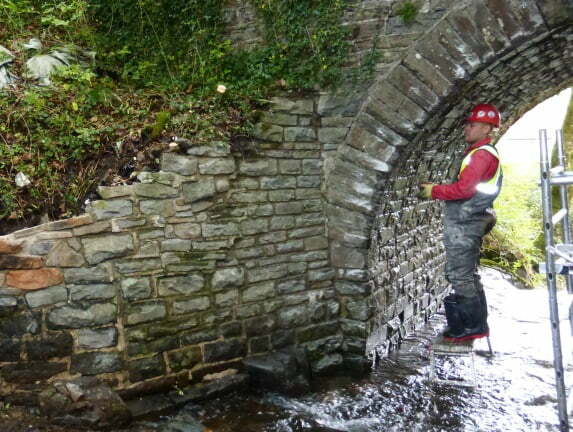 EDS have worked closely with Local Authorities across South Wales on successful bridge and culvert engineering maintenance programmes for over 10 years. Over time our methods and materials have changed dramatically to continually offer our customer the best quality at a competitive price. Our team is able to come up with innovative solutions to overcome all challenges. This included using a smaller diameter plastic pipe as formwork to cast a 150mm thick concrete protection to a 1.5m dia. Armco pipe culvert, which was heavily corroded. 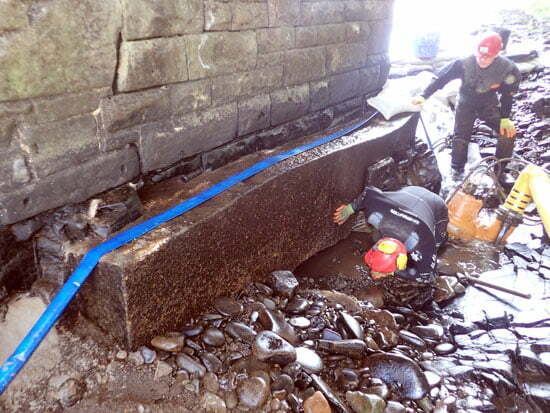 The formwork allowed the water to flow over the top of the repair without the risk of a pollution incident. We use a Fibrin XT additive as reinforcing to reduce the cost of steel meshwork and reduce the time frame of the works. Our most recent technological advancement is an environmentally friendly cementitious concrete for mass concrete repairs, masonry repairs or re-pointing works. Where culvert works do not require to match the existing construction, high density concrete blockwork is used to reduce the labour time without impacting on the strength of the repair material. The repairs are then carried out on a reduced time scale with cheaper materials but do not compromise on quality. EDS have purchased our own grout pump to reduce the hire costs to our customers and all of our employees have been trained in the correct working procedure by the pump manufacturer. Working for Carmarthenshire County Council EDS trialled, with great success, a concrete canvas material. The concrete canvas is delivered dry and is installed then hydrated to set with the same properties of reinforced concrete. The trail was carried out in an Armco pipe section culvert where the concrete canvas will mould to the shape of the culvert. 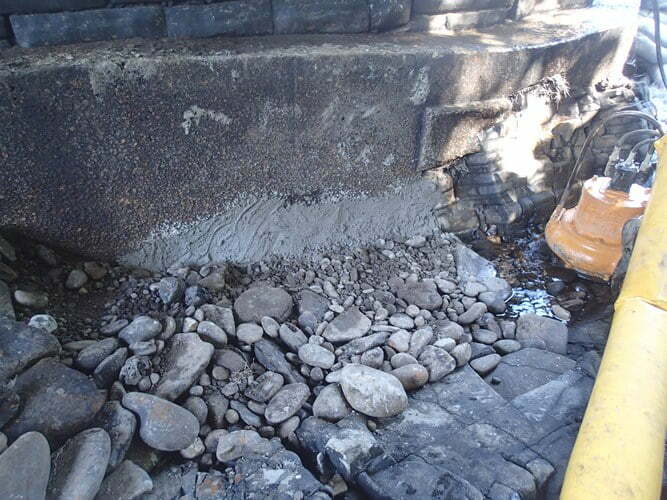 No delivering wet concrete to site reduces the potential of a pollution incident within the watercourse. 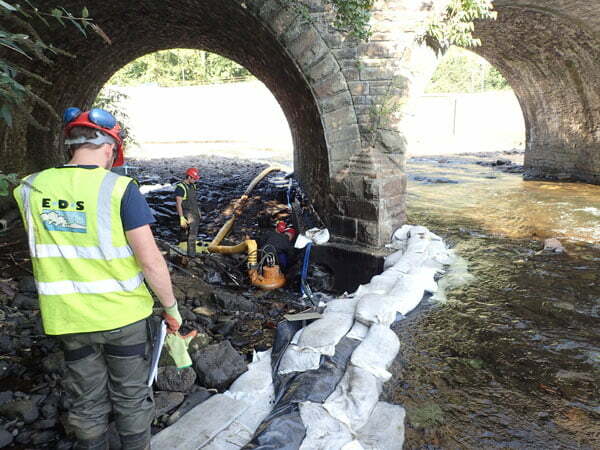 EDS have also used Sedimats in small river systems during debris clearances from both culverts and bridges to reduce the environmental impact on all fauna and flora within the river systems. The Sedimats contain the silt whilst allowing water to flow freely over.